Caius Pius Esuvius Tetricus (also seen as Gaius Pius Esuvius Tetricus but better known in English as Tetricus II) was the son of Tetricus I, Emperor of the Gallic Empire (270-274). 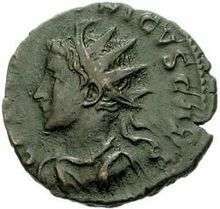 In 273, he was raised to the rank of Caesar, with the title of princeps iuventutis, and in January 274 he started his first consulship, together with his father. After the defeat and deposition of his father in the autumn of 274, he appeared as a prisoner in Aurelian's triumph, but the emperor spared their lives. According to some sources, he had also kept his senatorial rank. ↑ According to König (I. König, Die gallischen Usurpatoren von Postumus bis Tetricus, München 1981, p. 158ff. ), the elevation to Caesar is to be placed in 271 or 272. Drinkwater (J. F. Drinkwater, The Gallic Empire. Separatism and Continuity in the North-Western Provinces of the Roman Empire A.D. 260-274, Stuttgart, 1987) has provided good reasons to support 273 as year of elevation. ↑ Aurelius Victor, Liber de Caesaribus, 35.5.